Damla Su Özer was awarded the Arif Mardin Summer Fellowship Grant for the summer of 2014. 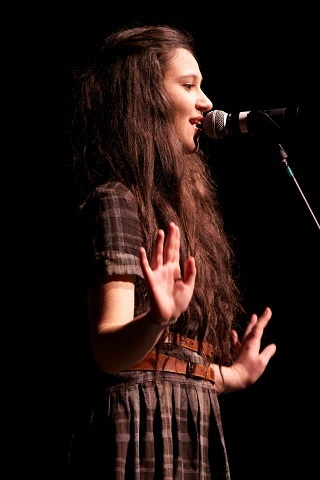 Shortly before traveling to the US, she made some recordings and sent them to a national competition called the "Nardis Jazz Vocal Competition". Damla won an award from this competition, which allowed her to represent Turkey at a jazz workshop in Poland in early 2014. What did you study during your fellowship, and with whom did you study? I took Musicianship, Theory, and Performance Skills classes during the 5-Week-Performance-Program in Berklee College of Music, taught by highly esteemed musicians such as Darcel Wilson, Tom Stein, Kaimy Masse, Rebecca Shrimpton and many more. What was the highlight of your experience as an Arif Mardin Fellow? The highlight of my five weeks in Berklee was definitely getting into the top ten amongst the vocalists and getting to perform on the Berklee Performance Center, which was always a dream of mine. How has your experience as an Arif Mardin Fellow impacted your work as a musician/artist? My performance skills have improved so much. I feel a lot more comfortable on stage and I am not afraid to utilize my vocal potential to its full extent with more confidence. What do you hope to do five years from now? I hope to be a working musician surrounded by people who share my passion. Is there anything else that you would like to tell The American Turkish Society community about your experience? This has been the best time of my life. I am truly grateful. Thank you for allowing young people to follow their dreams.